If there’s anything avid animal lover and Millikin Biology professor Dr. Marianne Robertson can’t stand, it is having downtime. Both her kids in college left her a lot of time on her hands. She decided to rescue animals and give them a quality of life. 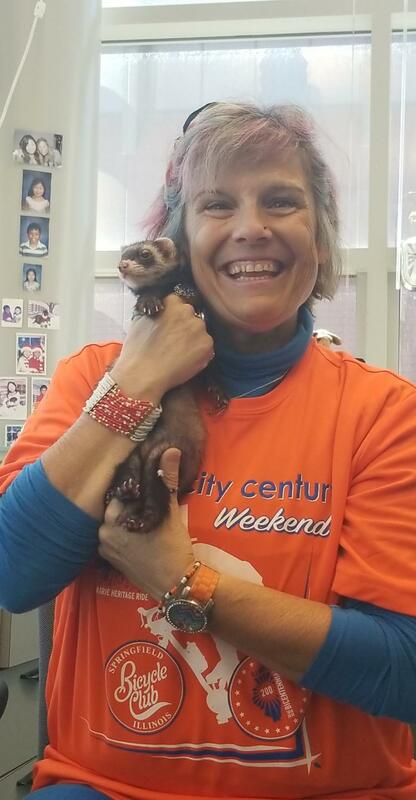 In her office, Dr. Robertson has five animals: two parakeets named Johnny and Roy, two chinchillas named Quasar and Toby, and a ferret named Nelson Mandela. Nelson is a ferret who lives for attention. Provided a baby gate is put up near the door, students can let Nelson out and play with him. When it comes to exploring/crawling into things, backpacks, boots, shoes, and shiny objects are fair game. Dr. Robertson sometimes even takes him into the lab and lets him run around while students are working. “Typically, by Friday afternoons, he just wants to sleep and not [do] much else, because he’ll get so much attention during the week,” Dr. Robertson said. Nelson’s special friends aren’t limited to students. He even has a close bond with President White himself! Nelson has his own mini Millikin baseball cap. He’s been to President White’s office many times and the two of them formed a special relationship, which perhaps makes Nelson the most famous of Dr. Robertson’s office pets. Although Nelson came from an abusive environment as well, he responded with love and attention. For the other animals, their response after living through abuse is the need to find their own space, so they don’t want to be taken out of their cages and cuddled. The chinchillas, in particular, came from abusive environments. However, that’s not to say they don’t like having special treatment. If there’s one thing Dr. Robertson never feeds her pets, it’s generic pet treats. They contain a high amount of fat, and wouldn’t improve or maintain good health. As a general rule of thumb, less treats is better than more. Instead, she gives them special treats. For Nelson, she gives him a banana yogurt treat made exclusively for ferrets. She gives the chinchillas wooden structures and red hard substances to chew on, the latter being especially good for keeping their teeth filed. Another special treat chinchillas enjoy is taking dust baths. Though it may sound contradictory, it actually serves a practical purpose. In their habitat, getting wet could be costly. Their fur is so thick and fine that if they get wet, it could take a while to dry, so fungus and bacteria can develop. To clean themselves, they roll around in volcanic dust to remove oils and grease. Besides her office pets, Dr. Robertson has other rescue animals in her home. She has six dachshund dogs, a stray mother cat with four kittens, two other ferrets, two other chinchillas, two guinea pigs, five rats, three gerbils, twenty-something hamsters, seven tarantulas, and several various invertebrate organisms like millipedes and hissing cockroaches. Most of these animals come from a local pet store. If the animal is too old to sell, gets injured, is born blind, or otherwise can’t be sold, Dr. Robertson takes them in to give them the best quality of life possible. No matter the animal, chances are they would be welcome into Dr. Robertson’s home, office or lab.